Marcus Pfister’s “The Rainbow Fish,” is a lesson on how sharing can make us feel good. The fish are drawn by starting a line for one side of the tail of the fish, extending the line and making an oval shape, then extending the line for a second side of the tail. A curved line finishes the tail. Fins are drawn at the top and bottom of the fish shape; a curved line is drawn inside the oval to make the fish head; an eye is drawn with a small solid circle inside a larger circle; draw lips and then scales. The directions for this project, “Rainbow Fish,” can be found in the 1st Grade Projects Gallery in the sidebar. 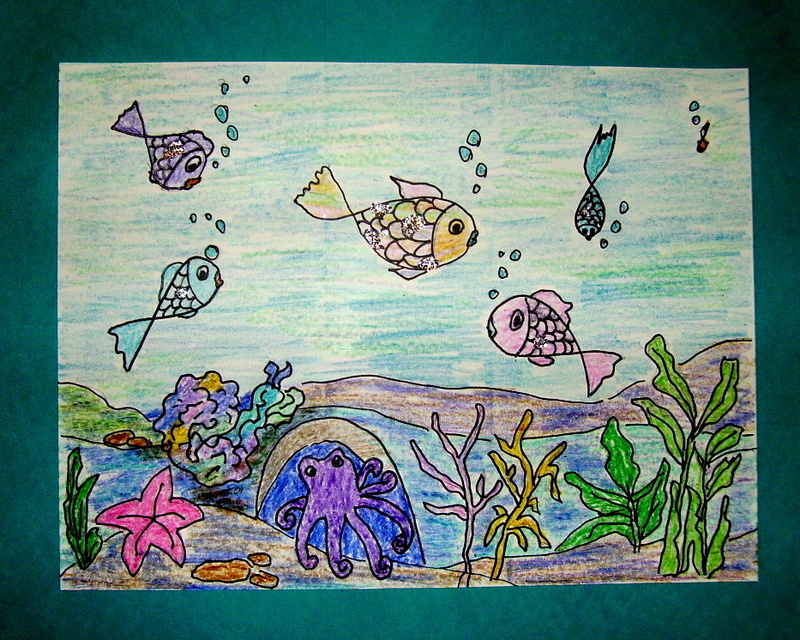 This entry was posted in 1st Grade and tagged 1st grade, art and crafts for kids, drawing fish project, fish drawing, how to draw fish, kids drawing fish art, project, rainbow fish. Bookmark the permalink.